Be the first to share your favorite memory, photo or story of Olean. This memorial page is dedicated for family, friends and future generations to celebrate the life of their loved one. 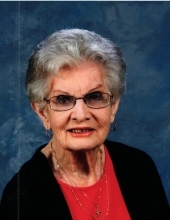 Olean Bullock, 88, of Petal passed away on November 27, 2018 at her home. Visitation will be Friday, November 30, 2018 at Macedonia Baptist Church from 1 P.M. until service at 3 P.M. followed by burial in Macedonia Baptist Church Cemetery. Mrs. Bullock was a member of Macedonia Baptist Church for seventy-one years, where she was a Sunday School teacher and a part of different organizations. She was a volunteer fireman for the Macedonia Fire Department. She was a special grandmother and great grandmother, who loved her grandchildren and great grandchildren very much. She was preceded in death by her parents, Louis and Lonie Morgan; her husband, Ernest Bullock; and her two brothers, Robert Morgan and Dennis Morgan. She is survived by her daughter, Betty (Jerry) Carpenter; her two sons, Marlin (Donna) Bullock and Kenneth (Michelle) Bullock, all of Petal; eleven grandchildren, Kevin Carpenter, Kyle Carpenter, Amy Trusler, Matthew Bullock, Benjamin Bullock, Jamie Williamson, Adam Bullock, Emily Bullock, Tyler Bullock, Jennifer Cruz, and Tabitha Dillard; twenty great grandchildren; and her sister Virginia Mann of Seminary. To send flowers or a remembrance gift to the family of Olean V. Bullock, please visit our Tribute Store. "Email Address" would like to share the life celebration of Olean V. Bullock. Click on the "link" to go to share a favorite memory or leave a condolence message for the family.